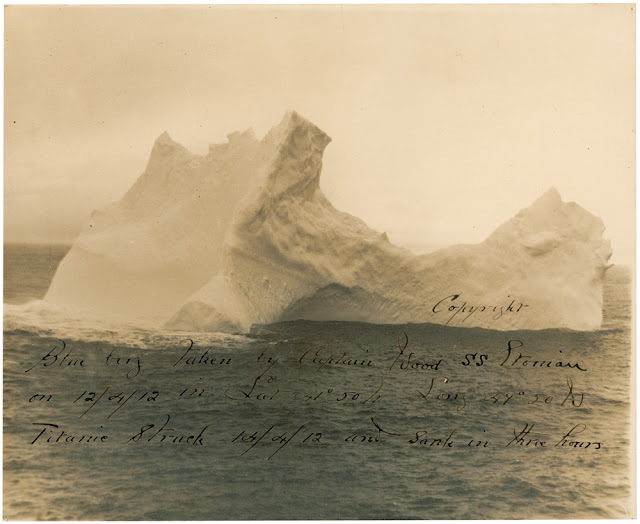 November 28, 2012 /Photography News/ An original photograph of the iceberg suspected of sinking the Titanic in the North Atlantic in 1912 will be sold at an RR Auction on Dec. 16. The 9.75 x 8 photo of a uniquely-shaped ‘blueberg’ was photographed by the captain of the Leyland Line steamer S. S. Etonian two days before Titanic collided with it. The photo shows is captioned in black ink by the captain, “Copyright. Blueberg taken by Captain W. F. Wood S. S. Etonian on 12/4/12 in Lat 41° 50 W Long 49° 50 N. Titanic struck 14/4/12 and sank in three hours.” A “blueberg,” as indicated in Wood’s caption, simply refers to the tinting of an iceberg from the sun’s rays, much like the blue of the ocean. Experts believe it's the same iceberg because it was photographed in the right area and matches descriptions and sketches from that time. The photo is expected to fetch between $8,000 and $10,000, and it is just one of over 400 Titanic memorabilia items included in American auction house RR Auction's sale next month.